I give up. I've been meaning to put it down several times, but a part of me wanted to read this through the end. But right now, I just don't care anymore. Life is too short and there are other books beckoning, and would probably engage me. It was a long shot anyway, I'm not really into adult romance these days. 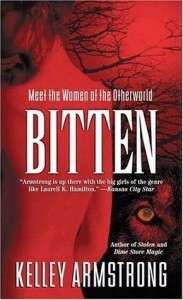 Bitten would be pretty alright, for fans of werewolves. Kelley Armstrong knows how to make good stories. This just wasn't my cup of tea, I guess.